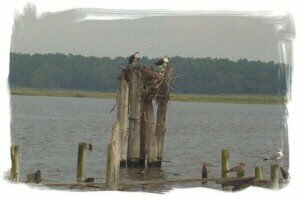 Activities: bird watching, bike riding, canoeing, fishing, kayaking, photography, power boating, sailing, waterfowl hunting & walking. Where to stay: this area has a "Martha's Vineyard" circa 1950, 60's feel to it. Very old charm Chesapeake Bay small town living. There are only approximately 10 whole house vacation rental properties on the island. Hotel rooms can be found �inland �along rte 13 in Princess Anne, Salisbury and Pocomoke City. Send email inquiries to scenic@dealislandmaryland.com. Where to eat & purchase goods: there are 2 small market/convenience stores each with a deli & sit down restaurant and they sell gasoline & alcoholic beverage as well. Lucky's is in Chance just before the Deal Island bridge. Arby's is on Wenona Harbor. For grocery shopping, most folks do the 30 minute car ride "in to town" to Princess Anne or another 15 minutes to Salisbury. by air: Salisbury Regional Airport has daily flights from Philadelphia, Reagan National & BWI (Baltimore) Airports.